Want secure dividends? Want to sleep at night? Here are three-rock solid stocks that have beaten the market over the short and long terms. 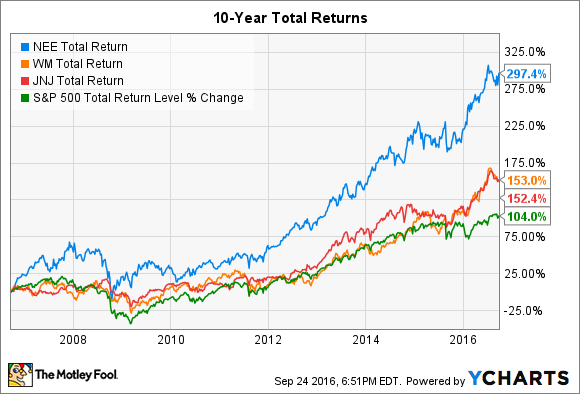 All three lower-risk stocks have beaten the market over the last 10 years (as well as one and five years). Data by YCharts. Investing in stocks will always involve risk, but you can lessen the degree of risk by favoring certain types of stocks. Generally, stocks of companies that are leaders in their fields, operate in industries that have high barriers to entry, provide an indispensable product or service, and pay a dividend tend to be lower risk over the long term. Valuations naturally matter, as paying too much for a stock increases the potential for it to decline, though valuations matter less as your investing horizon expands. Low risk doesn't have to equate to low performance, as the preceding chart shows. The following three relatively low-risk stocks have beaten the market over the long term, and there is no reason to believe this dynamic won't continue. So let's look more closely at NextEra Energy (NYSE:NEE), Waste Management (NYSE:WM), and Johnson & Johnson (NYSE:JNJ). NextEra Energy provides a product that's essential to all of us living in the developed world: electricity. Moreover, the company is a heavyweight in its industry, as one of its two principal subsidiaries, Florida Power and Light Company, is the third-largest electric utility in the United States, serving more than 4.8 million customers and more than 10 million people across nearly half of the state of Florida. So we can check off that NextEra provides a basic-need product and that it's a leader in its industry. And, of course, utilities in general have high barriers to entry to keep potential new competitors at bay, since their core businesses are generally monopolies or at least have extremely high fixed start-up costs. Moreover, the company has another even stronger leadership position -- its NextEra Energy Resources subsidiary, together with its affiliated entities, is the world's largest generator of wind and solar renewable energy. As the cost to provide alternative energy declines, the company's huge portfolio should provide it with a cost advantage over competitors. NextEra isn't a stodgy slow-growing utility, with analysts estimating that the company will grow earnings per share at an average annual rate of 7.2% over the next five years. Put this growth potential together with an attractive dividend that's currently yielding 2.7%, and NextEra Energy is a stock that could electrify your portfolio over the long term, with few shocks along the way. Waste Management provides services that no civilized society can live without – collecting treash, including recyclables, that residential, commercial, and industrial locations generate, and disposing of them in its landfills. The company, which operates in the the U.S. and Canada, has the largest network of recycling facilities, transfer stations, and landfills in the industry. Waste Management is also a renewable-energy provider. It recovers the naturally occurring methane gas generated inside landfills to produce electricity, which is fed back into the grid. It has more than 130 such facilities across North America, providing a total of more than 650 megawatts of power capacity per year -- enough to power nearly half a million homes per year. Moreover, it has a facility that converts the landfill gas to liquefied natural gas, which it uses to fuel some of its trucks, helping it save on fuel costs. This is a business with considerable barriers to entry that include high fixed start-up costs and regulatory hurdles with respect to the landfills, which makes it unattractive for potential new competitors to enter the business. The company is a slow but steady grower with respect to revenue and net income, so this isn't a stock that's likely to ever outperform the market by much over longer periods. However, Waste Management is very shareholder-friendly and has long been committed to buying back shares, which continues to help boost earnings per share -- and, hence, the stock price. Moreover, Waste Management's dividend is currently yielding an attractive 2.6%, with its payout ratios based on net income (61.4%) and free cash flow (54.3%) suggesting that there's room for future growth. Johnson & Johnson is probably best known to consumers as the maker of such household staples as Band-Aid adhesives, Listerine mouthwash, and Advil over-the-counter painkillers. Besides its mighty consumer-products business, the company also owns the world's most complete medical-devices business and the fifth-largest pharmaceuticals business. Like electricity and trash services, healthcare is a category of products and services that it would be almost impossible to live -- or at least live somewhat healthily -- without. Moreover, J&J enjoys considerable barriers to entry across its businesses from regulatory hurdles and extensive industry partnerships in its medical-devices and pharmaceuticals businesses to dominant brand strength in its consumer-products business. Johnson & Johnson also sports healthy growth prospects, with analysts projecting it will grow EPS at an average annual rate of 6.5% over the next five years. The company's earnings should benefit from two demographic trends: the aging of the massive baby boom generation and waves of the world's population that continue to move into the middle class, placing healthcare products and services more within their financial reach. Lastly, J&J's dividend is just what the financial doctor ordered, as it's about as secure and dependable as it can get. The company is a "dividend aristocrat," one of only about 50 S&P 500 constituency companies that have increased their dividend payouts for at least 25 consecutive years. Johnson & Johnson's 6.7% dividend hike earlier this year marked its 54th consecutive year of increasing its dividend.